It’s no surprise to some of you that I’m a fan of twitter, it’s become my go to social media platform. After feeling shut out on Facebook. I created a Twitter account and the rest they say is history. There are many reasons why I prefer twitter. I feel it’s easier to create genuine connections. I’ve been lucky to meet a number of vintage sellers and like minded people who have become good friends and together we are a #VintageFamily. Twitter is also friendly to business users. If you are new to twitter then it’s important to know that hashtags are a big part of the experience. Using hashtags in your tweets helps users find and see your content. For vintage businesses this is a great tool for promotion. In this article I share my top ten favourite vintage hashtags for twitter users and small businesses. Hosted by @Kittysvinvault every Wednesday at 8pm-9pm GMT. 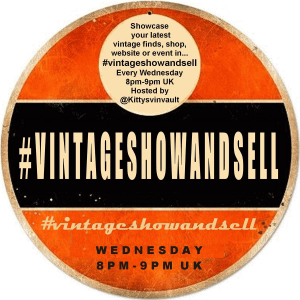 #vintageshowandsell offers a great hour to “showcase your latest vintage finds, shop, website or event” to a number of like minded people and vintage lovers. Got Vintage is much bigger then first imagined. Created by a group who grew together “to share their authentic vintage products to the world.” It has become a “source for authentic vintage goods” from a number of worldwide vintage sellers. Although this hashtag appears to no longer be supported by any promotion pages. It still remains a popular tag among vintage sellers who continue to network and share contact via this tag. Vintagefinds is a hashtag with a wide reach, it’s supported by many sellers and collectors making this a popular tag to engage with. In conclusion, it’s always important to remember what works for one person may not work for another. The same thing can be said about online marketing and hashtags. When sharing your Tweets and content experiment with hashtags in order to find your perfect fit. Do you know of any other vintage themed hash tags? Comment them below and together we can build a useful resource.